QuickBooks Online contains a standard set of features that can accommodate a broad cross-section of the millions of small businesses in the U.S. It also offers customization options that you can use to make it your own. Two of these are custom fields and classes. You can start working with custom fields and classes at any time. They’re most effective, though, when you build them in as you’re just starting to use QuickBooks Online. Let’s look at custom fields first. When we refer to “fields,” we simply mean the rectangular boxes in records and forms that either already contain data or that can be filled in by you, either by entering the correct word or phrase, or by selecting from drop-down lists. Most of these are already named. On an invoice, for example, there are fields for information like Invoice date and Due date. You can define up to three custom fields on sales forms and make them visible internally and/or to your customers. Click the word Off if it appears, and it will change to On and display three blank fields. Think carefully about what you would like to appear here, as this isn’t something you’ll want to change. If you haven’t yet met with us about how to set up QuickBooks Online, let’s schedule some sessions to go over all your setup procedures, including custom fields. Enter the words or phrases you want displayed on sales forms in the three fields. Then decide whether you want them to be visible only to you and your accounting staff or to your customers, too. Click within the Internal and Public to create checkmarks. When you’re done, click Save. 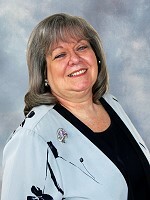 QuickBooks Online’s classes provide another way to categorize transactions. You can use them to differentiate between, for example, departments or divisions. If you’re a construction company, you might have different classes for New Construction and Remodel. Unlike custom fields, you’re not limited to three classes. You can filter many reports by class. QuickBooks Online contains report templates designed specifically for reporting by class, like Sales by Class Detail, Purchases by Class Detail, and Profit and Loss by Class. Class-tracking in QuickBooks Online helps you create more targeted reports. Even if you’ve defined a number of classes, they’re not required on transactions. If you want to be reminded should you forget to classify one, click in the box in front of Warn me when a transaction isn’t assigned a class. 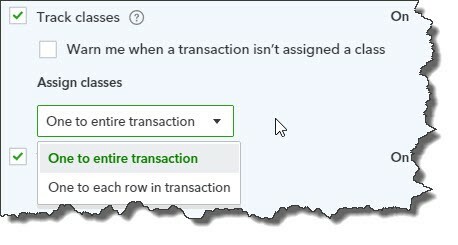 You can also choose to assign one class to an entire transaction or to each individual row. Click the arrow to the right of One to entire transaction to drop the option box down and make your choice. When you’re done, click Save. You can create classes as you’re entering transactions by clicking the arrow next to Class over to the right of the screen and selecting +Add new. We recommend, though, that you think this through ahead of time and make at least an initial list by clicking the gear icon in the upper right and choosing All Lists, then Classes, then New. These are two of the customization tools that are built into QuickBooks Online. Whether you’re just getting started or you’ve been using the site for a while, we can introduce you to all the ways that you can make QuickBooks Online your own.